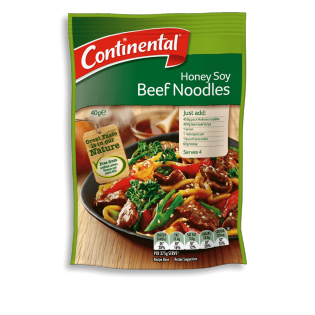 Continental's honey soy beef noodle recipe base is blended with onion, garlic, ground black pepper & ginger. Learn how to create an authentic Asian dish here. i would love to write a review but i can't seem to buy this at either coles or woolworths!! Sorry to disappoint you but this has been deleted from the range. Hi Jasmin, sad to say but this has been deleted from our Continental range due to poor sales & low distribution. Sorry to disappoint you. This is the best recip base contine have released. SadlY its been taken off the market. Please bring this back.What a shame all the best prod are disappearing :( Id do anything for a Carton of these!